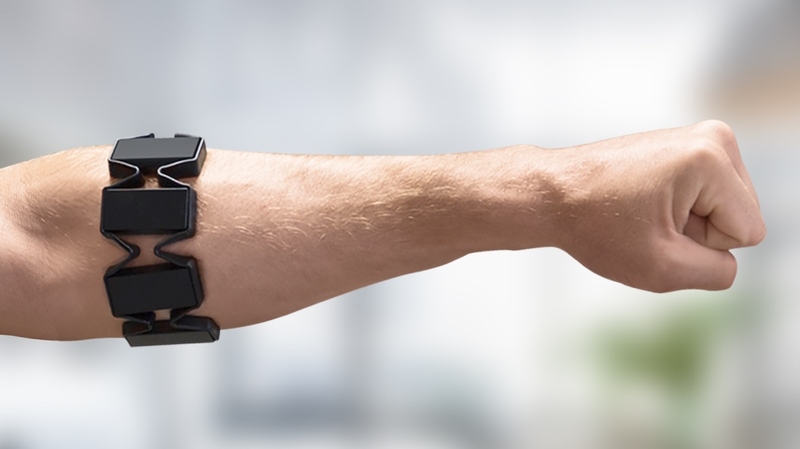 The Myo armband is a $199 gesture control wearable from Thalmic Labs that's all about changing the way we interact with the world. You wear it on your forearm and a series of motion and muscle sensors are able to track movement in a really sophisticated way. It's been available for people to tinker with for a few years now. But we are only now beginning to see how Myo can really make a difference away from controlling presentation slides and replacing your computer mouse. Myo even has its own Market app store making it easier to bring the gesture controller closer to the things you use everyday. Here, we've picked out the more eye grabbing examples of the innovative wearable being put to good use. There's a man named Johnny Matheny and he has a prosthetic forearm. With the help of a Myo and the John Hopkins Applied Physics Laboratory, when he thinks about moving his arm, his arm now moves. Opening his hand, shaking hands, making a fist, picking up objects and rotating his arm are all possible as well. Check the video above to see it in action. Researchers from the Arizona State University have found a way to use the Myo controller to translate sign language. The system, which is known as Sceptre, uses a pair of the wearables that can match gestures and signs to a database and then display it as a text on a screen. The team has managed to successfully recognise a series of words and phrases including 'headache', 'upset stomach' and 'all morning'. You don't have to be a fan of Dutch DJ and music producer Armin van Buuren to appreciate that being able to control your show while in front of your decks is pretty cool. Using a pair of custom designed bands at a gig in Ibiza, van Buuren was able to adjust lights, activate video, turn on effects and sound. Buuren said it helped create a unique experience for clubbers and made him feel closer to them. We'll take your word for it, Armin. If you head over to the Myo's app store, the Parrot app is the one that unsurprisingly stands out. Once you've downloaded the app to your phone or tablet and paired with the armband, you can grab your AR Drone and use a series of hand gestures to take control. Spreading your fingers will let the drone take off, moving your arm will move it side to side when airborne and a double tap will bring it back down when you've finished having your fun. Gaming and gesture control feel like the perfect match and we haven't even started talking about the role it could play for VR gaming. There's a few videos out there showcasing what Myo can do when it's been swapped for a keyboard or controller. This one demonstrating how it could work with first person shooter Battlefield brings a whole new meaning to raising your weapon during the heat of the battle.